At LDC we disagree with the notion of ‘the death of the high street’. Instead, we track market trends at the most granular level possible to really understand how individual locations are evolving and what these changes mean as regards to risks and opportunities for any given operator. What we see in our data is an evolution, which if analysed and understood properly, can be used to ensure new site potential and ongoing profitability. At LDC we have an army of 50 field researchers who physically visit half a million retail and leisure premises, at least twice a year, to record all occupancy, vacancy and churn across the market. We have been doing this for a decade. There has been drive for more and more detailed data and innovation in this space to reduce risk and further help quantify and forecast opportunity for our partner brands. This led LDC to develop its own commercially scalable footfall tracking technology. These sensors can be readily installed in a unit and provide hourly counts of ‘pavement opportunity’ passing the store. We believe data can (and should) drive decision making. Here, I will explain why we believe that the power of data is so strong. LDC’s historical data clearly quantifies the structural changes that are widely acknowledged in our industry. In Table 1 you can see that over a five-year period, there have been a net 9,207 closures in what LDC calls the ‘comparison goods retail’ category, which covers retailers selling items such as clothes, books and furniture. The other notable change is the increase in the number of leisure occupiers that are now present on our high streets, shopping centres and retail parks. This growth in the number of leisure units is indicative of the changing nature and purpose of the places we visit. We no longer go shopping just to ‘buy stuff’. Consumers now place far more emphasis on experience and enjoyment, involving not just shopping, but eating, drinking and socialising too. Increasingly, it is the quality of the leisure offering a scheme or location that drives how many people visit and how much they spend. LDC’s data reflects this and over the past five years, the number of restaurants has grown by almost 10% (2,283 units). Breaking this down further, there are specific concepts and trends in this space which are growing rapidly. Table 2 shows the top restaurant types that have seen growth rates of over 100% in the 12 months from June 2016 to June 2017. It’s key to understand where the undersupply of a certain cuisine in an area can be an opportunity for growth, and where oversupply or too much competition will harm your chances of success in that location. Driven by consumer demand, the growth in Food & Beverage (“F&B”) outlets has been unrelenting, with the level of competition and, therefore, risk getting higher. Of course, driven by this demand, leisure brands still have an appetite for growth across the UK; however, the ‘easy wins’ are becoming less and less obvious. Having a data-driven view of your own key performance drivers, combined with the competitive landscape, location ‘health’ and pitch, is critical. 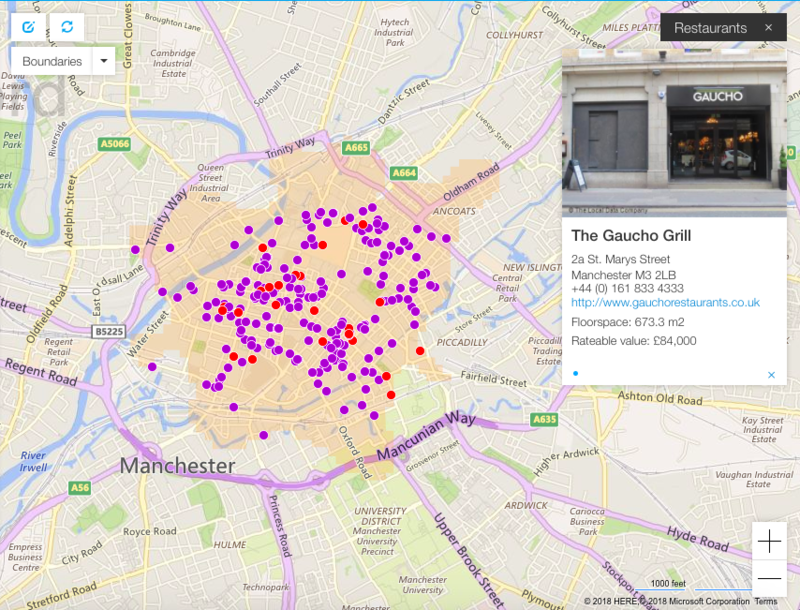 Competition in Manchester in the F&B space is fierce, as can be seen in the map above, where 13% of the entire retail stock is made up from restaurants, compared to a GB average of under 5%. This is fairly typical of big cities, and therefore if you don’t have an appetite to fight for customers, you might want to seek out a town close by to set up shop. For example, 12 miles down the road in Bolton, restaurants are underrepresented at just over 3% of the total retail stock. Of course there is still opportunity in cities like Manchester, the trick is finding it and ensuring you have a relevant offer. LDC’s new footfall technology, SmartStreetSensor, enables brands to not only understand existing and prospective locations through occupancy and vacancy trends and changes in the local competitive environment, but also flows of people at street level. Our home-grown technology works by using Wi-Fi connections from passing mobile phones as a proxy for footfall. This enables us to map footfall flows, monitor trends, identify hotspots by hour and link pavement opportunity to ‘consumer mission’ through occupancy data. Manchester is a great example of how footfall profiles vary street by street. The charts below compare Lower Deansgate to Oxford Street and show how footfall differs significantly Monday to Friday and at weekends. Over 40 operators now have our technology installed in some or all of their portfolio. Tracking hourly, weekly and monthly footfall counts for an existing estate provides operators with a key metric for benchmarking performance on an ongoing basis and optimising the store operating model. Below is an image from LDC’s online heat map which shows Kingston upon Thames where we have 20 live SmartStreetSensors in operation. The ‘hot’ dark orange polygon identifies the area covered by the sensor on Union Street and shows that peak footfall for Kingston between 1-2pm on a Friday is here (our sensor counted approximately 2,800 people in one hour). More detailed analysis shows a pattern of steady weekly footfall with little variation aside from a slight uplift on a Saturday afternoon. Let’s compare this to a totally different location, for example, Holborn - a major transport hub in central London. Image 4 reveals a very different profile to that of Kingston, where peak flows are between 8am and 9am, with approximately 4,800 people per hour. However, another major difference is that the area has a Monday to Friday economy with pre-eminent flows around working hours and lunch time. This is typical of a ‘commuter zone’ with the footfall decreasing on the weekend. Therefore this location would be an ideal spot to offer coffee and take away breakfasts during the week-day morning peaks – though perhaps not suitable for a fashion brand relying on a weekend shopping mission. But why are we so excited by footfall? The data is also being used to optimise existing sites. This data feed is enabling brands to benchmark and monitor capture rates on an ongoing basis, by hour, week and month. This metric gives operators a quantified view of the success of marketing campaigns and promotions at store level as well as optimising store opening hours, staffing and benchmarking capture rate by day part. Looking to the future, LDC will continue to build and monitor the most intricate, data driven view of our physical landscape, helping brands to leverage data to uncover great opportunities. For more information, visit: www.localdatacompany.com/footfall or ask Lucy any questions about using footfall to drive growth by emailing marketing@localdatacompany.com. This article was originally published in BDO’s restaurants and bars report, which can be downloaded here.